It’s not often you can say that UKIP and the Green party are united in their political aims, but on the contentious subject of the proposed Transatlantic Trade and Investment Partnership (TTIP) they are singing from exactly the same hymn sheet. So let’s backtrack a minute and examine what we know about TTIP. Essentially, it is a free trade agreement between the US and Europe which has been under negotiation since 2013. The intention, according to Julia Kollewe, is to create world’s biggest free trade zone spanning the north Atlantic. TTIP’s proponents suggest that it would eradicate tariffs, reduce red tape and ease restrictions on investment. EU companies of all sizes will find it less burdensome to export to the US and vice versa. The European Commission insists that all developments will boost the EU economy and create jobs. TTIP, insists the EC, will bring EU and US standards and regulations more in line with each other without lowering consumer, health or environmental standards. Consumers will benefit from low prices, high standards and wider choice. Everyone’s a winner. But that’s not how it’s universally seen. Critics suggest that a harmonisation of standards under the agreement will mean the end of regulations in the EU protecting public health, food safety and the environment. There is also a real fear that TTIP will embolden transnational corporations to bid for all government spending. War on Want’s John Hillary argues that market access will be guaranteed which effectively makes state monopoly illegal – leading to the inevitable privatisation of key public services such as health and education. But what has united opposition to TTIP across Europe is the “investor-state dispute settlement” clause which would allow companies to sue foreign governments if they believe that they have suffered losses because of laws or measures of the EU or of individual EU member states. As Leala Padmanabhan points out on the BBC’s website, critics say that such development would undermine the power of national governments to act in the interests of their citizens. Investor-state rules could be used to smash any attempt to save the NHS from corporate control, to re-regulate the banks, to curb the greed of the energy companies, to renationalise the railways, to leave fossil fuels in the ground. These rules shut down democratic alternatives. They outlaw leftwing politics. This is why there has been no attempt by the UK government to inform us about this monstrous assault on democracy, let alone consult us. Whilst Monbiot is right about mainstream politics reticence in informing the electorate of the finer points of TTIP (the Labour party supports its “basic principles”) what has been astonishing is both the opposition to the agreement generated online and the effect of such opposition. Here’s the good news – thanks to people power, the majority of our UK MEPs are now against one of the worst parts of TTIP. It’s the part that would allow corporations to sue the government if they don’t like our laws … That’s big news – the more we expose the worst parts of TTIP, the more we chip away at the deal … In just a few months, thousands more people have joined the campaign against this awful trade deal. 38 Degrees members – and many other campaigners – can feel proud about the fight we’re putting up. We’re not about to stop now. 38 degrees is one of the UK’s biggest campaigning communities with more than 2.5m members and is part of a wider European movement. In February a cross-continent alliance of 170 civil society groups released a statement expressing “deep concern” about TTIP as a threat to democracy and an attempt to put the interests of big business before the protection of citizens, workers, and the environment. As Green party MEP Molly Scott Cato has highlighted nearly 2.5m people have signed a European Citizens’ Initiative petition against TTIP and there have been demonstrations all over Europe, such as the UK day of action in 15 cities last year, which are largely ignored by the mainstream media. According to economist Matthias Bauer such movements have become a significant “threat to advanced Trans-Atlantic economic integration”. He posits that negative online media reporting about in TTIP Europe is more than 20 times higher than positive reporting and that anti-TTIP groups dominate the online media debate – where their manifestos and objections are spread predominantly through Twitter and Facebook. Traditional online news portals hardly address anti-TTIP groups’ announcements. He sums up by stating that the “fears” spread have a huge impact on public opinion. In my 17 years as an MEP I’ve never received so much communication from the public on a proposed piece of legislation. 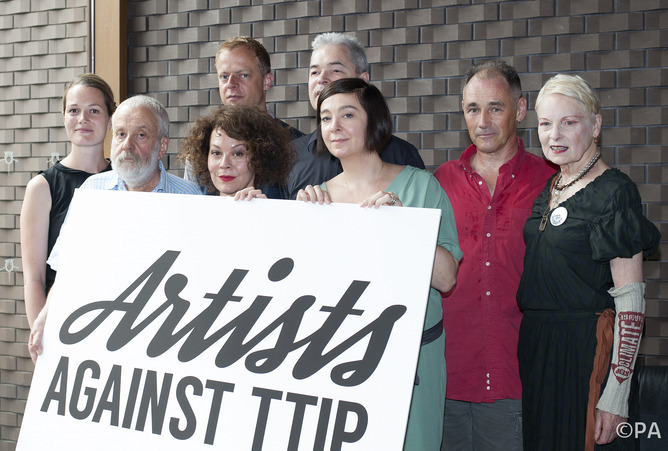 The TTIP has concerned millions of people across the European Union. They have bombarded their MEPs with phone calls, letters and emails and in response to this the EU is now running scared. That may well be the case – In June, the Green MEP, Molly Scott Cato, wrote that faced by a possible rejection of TTIP, Brussels cancelled a vote on the issue – ostensibly because there were too many proposed amendments. But according to Scott Cato there was cross-party support for an amendment to put on record parliament’s opposition to the ISDS mechanism fuelled by MEP’s receiving: “thousands of emails every day – an unprecedented level of interest from the public who normally find EU issues somewhat remote”. The European Parliament vote today is no way binding towards the final outcome of TTIP. Public opposition to TTIP is continuing to mushroom at an astonishing rate and will prove decisive in stopping this toxic trade deal from going through. Given all this, whether or not the concerted and widespread European opposition to TTIP halts its progress remains to be seen. Such a disparate band of campaigners is a strange thing to see in modern politics – but what is indisputable is the scale of the resistance – and the success of the pressure groups in marshalling their arguments and support to such a degree that some political representatives have been compelled to act.